U.S. 20 is a transcontinental route, leading from U.S. 101 in Newport, Oregon, east to Commercial Avenue in Boston, Massachusetts. U.S. 20 follows State Control Route 31 from Yellowstone National Park to Greybull via Cody, State Control Route 34 from Greybull to Casper via Shoshoni, Interstate 25 from Casper to Orin Junction, and State Control Route 40 from Orin Junction to Nebraska. Business U.S. 20 in Casper follows the original route of U.S. 20 before Interstate 25 was built to the north of the city. It is known as Yellowstone Highway and is cosigned with Business U.S. 26. At its eastern end, it is also cosigned with Business Loop Interstate 25 and Business U.S. 87. In Douglas, Business U.S. 20 follows Business Loop Interstate 25, Business U.S. 26, and Business U.S. 87 through the city. Bypass U.S. 20 in Casper is the bypass to the north of the city. The western half is cosigned Bypass U.S. 20-26, while the eastern half is signed as Interstate 25 and U.S. 20-26-87. A former Bypass U.S. 20 was routed in Manville, but it was decommissioned in 1982. The bypass is now mainline U.S. 18-20, and the old U.S. 20 into Manville is now Wyoming 274. 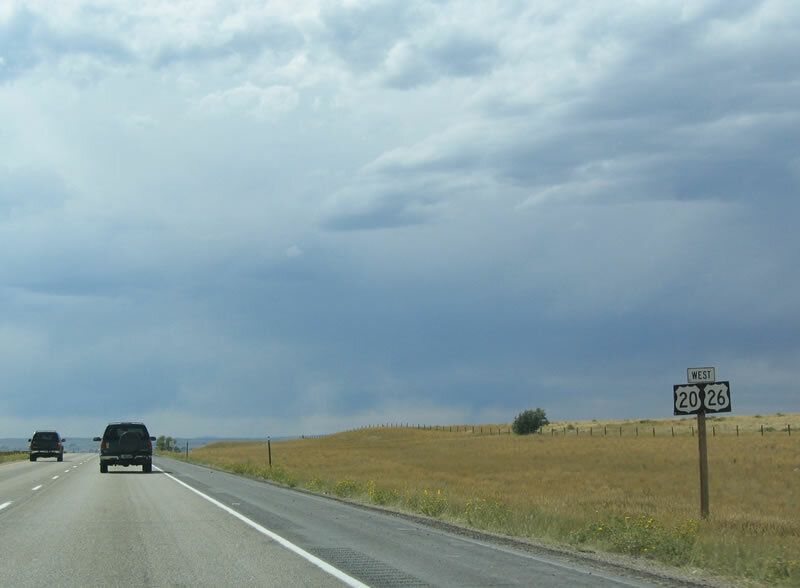 U.S. 20 has a few past and present auxiliary state routes (past and present): Wyoming 120, 220, 320, 420, and 520. The Old Yellowstone Highway was replaced by modern U.S. 20 between Casper and Thermopolis. The "Park to Park" was part of the "Yellowstone Highway," which ran Denver, Casper, Thermopolis, East Entrance Yellowstone Park. The "Yellowstone Highway" was established first but was absorbed by the "Park to Park," which initially ran an extension from the "Yellowstone Highway" in Denver to Mesa Verde, Co. The "Park to Park" soon connected all major western national parks and in doing so, the "Yellowstone Highway" lost prominence but not its name, which still described the Denver-Yellowstone route. This routing information was researched by Mike Jamison from Lee Whiteley's recommended new book The Yellowstone Highway, Denver to the Park, Past and Present. There was much debate in the mid-1920s regarding the future routing of U.S. 20. Plans originally called for U.S. 20 to run from Astoria, Oregon, to Yellowstone National Park, Wyoming, via U.S. 30. This routing was in the 1926 Rand McNally Road Atlas. At that time, U.S. 30 was planned to end in Salt Lake City, Utah. However, Oregon and Idaho balked at the plan. For more on this, please turn to the U.S. 30 page. When the confusion cleared up, U.S. 30 was routed to Astoria, while U.S. 20 was truncated. U.S. 20 ended (or began) at Yellowstone National Park's East Entrance. Heading east, U.S. 20 went all the way to Boston, Massachusetts. Two auxiliary U.S. Routes from U.S. 20 -- U.S. 320 and U.S. 420 -- connected U.S. 20 to Riverton and Billings. U.S. 20 was extended west into Montana, Idaho, and Oregon around 1942, partially to replace old U.S. 28 in Oregon. Despite this extension, there are two sections of U.S. 20 with an "official gap" through the Park, according to AASHTO. Hence, U.S. 20 is not "officially" a transcontinental U.S. route, but for all intents and purposes it is ... at least in the summer. U.S. 20 is split into two sections, separated by Yellowstone National Park. The western section runs from Newport, Oregon, east to West Yellowstone, Montana. 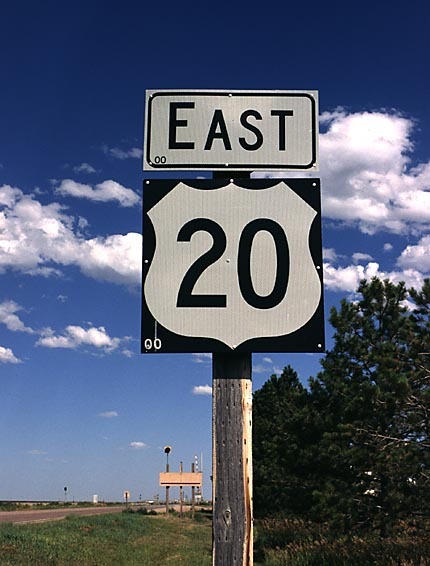 U.S. 20 officially begins it journey eastward in Wyoming at the East Entrance to Yellowstone National Park. AASHTO, which approves U.S. highway numbers, does not recognize the East Entrance Road, the Grand Loop Road, Norris Road, or the West Entrance Road within Yellowstone as part of U.S. 20, even though these roads provide the most logical connection between the eastern and western portions of U.S. 20. This gap in the U.S. 20 designation is due to the fact that roads within the park are maintained by the National Park Service and because numerical highway designations are seldom used, as a rule, in National Parks. For a guide to the Yellowstone connection between the two sections of U.S. 20, go to the Grand Loop Road page. Heading out of Yellowstone, U.S. 20 is merged with U.S. 14 and U.S. 16. Both of these routes begin at the East Entrance, and they are multiplexed with U.S. 20 east through Cody to Greybull. U.S. 14-16-20 is currently being reconstructed by the Wyoming Department of Transportation between the East Entrance and the Shoshone National Forest boundary. This section of highway is also known as the "Buffalo Bill Cody Scenic Byway." Planned completion of this major construction project will be in 2002. For more details on this portion of U.S. 20 through the Wapiti Valley, Cody, Greybull, and Worland, please see the U.S. 16 guide. Once in Cody, U.S. 20 meets Wyoming 120, which offers a shorter route for through U.S. 20 travelers between Thermopolis and Cody via Meeteetse. U.S. 14 leaves the route at Greybull, and U.S. 16 splits from U.S. 20 at Worland. From there, U.S. 20 heads due south along with Wyoming 789 to Thermopolis and Shoshoni. Between Greybull and Shoshoni, U.S. 20 crosses the Big Horn River several times. Several Wyoming state secondary routes follow the river on the opposite bank, including Wyoming 432 and Wyoming 433. It is unclear if these routes were at one time designated as U.S. 20 or not. Note that south of Worland, "eastbound" U.S. 20 is actually heading southwest toward Kirby (a town that is accessed from U.S. 20 via the third-of-a-mile-long Wyoming 175) and Thermopolis. Thermopolis can lay claim to the largest single mineral hot spring in the world. The Wyoming State Buffalo herd is located here, as is a dinosaur museum. Here U.S. 20 meets Wyoming 120 again, which provides an alternate route between Thermopolis and Cody via the western edge of the Big Horn Basin. The elevation here is around 4,300 feet. About five miles south of Thermopolis, U.S. 20 (and Wyoming 789) enter the mouth of the Wind River Canyon. At this, the "wedding of the waters," the Wind River becomes the Big Horn River. Look along the highway for signs that identify key rock formations and discuss geological and historical facts. The Wind River is impounded through the canyon in the Boysen Reservoir, which is a well-known state park. 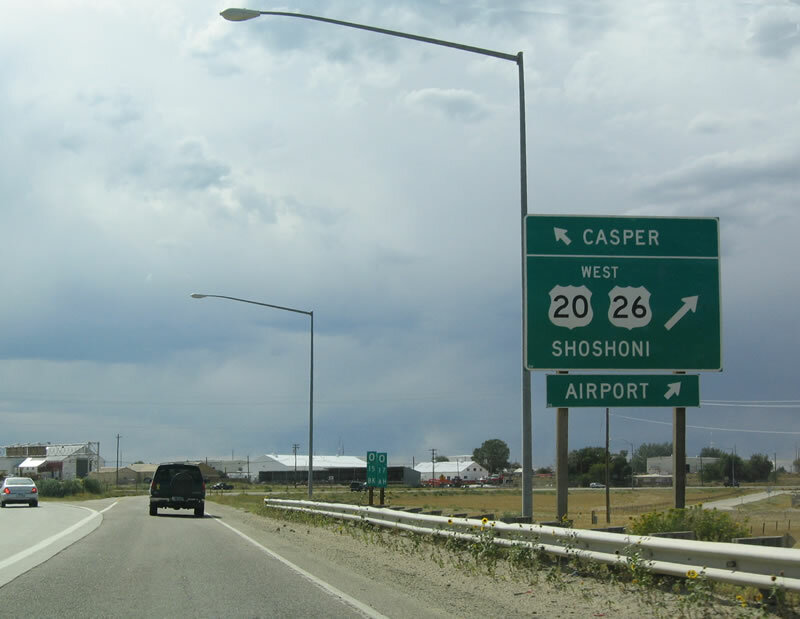 Before you know it, you're in Shoshoni, turning east toward Casper. 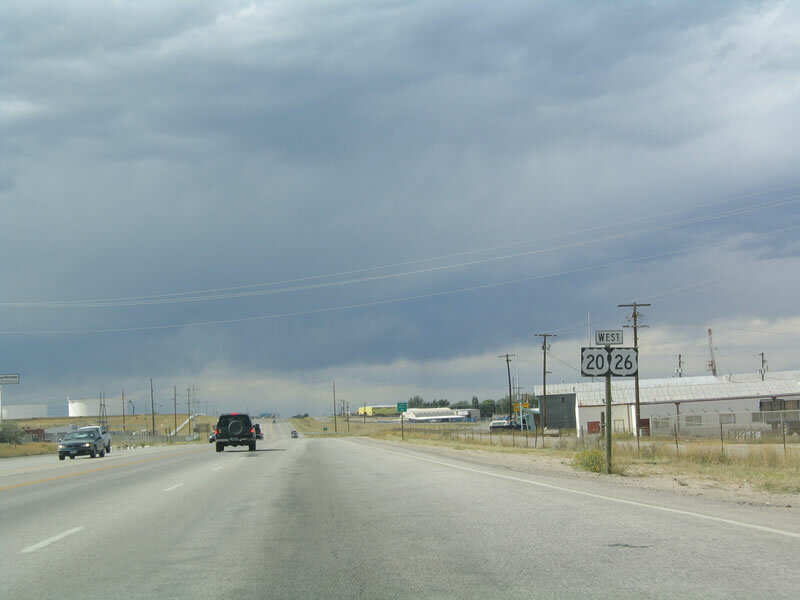 U.S. 20 and U.S. 26 merge in Shoshoni. U.S. 26 and Wyoming 789 continue southbound along the Wind River toward Riverton. U.S. 20-26, meanwhile, head due east toward Casper. The long drive between Shoshoni and Casper is fairly boring. 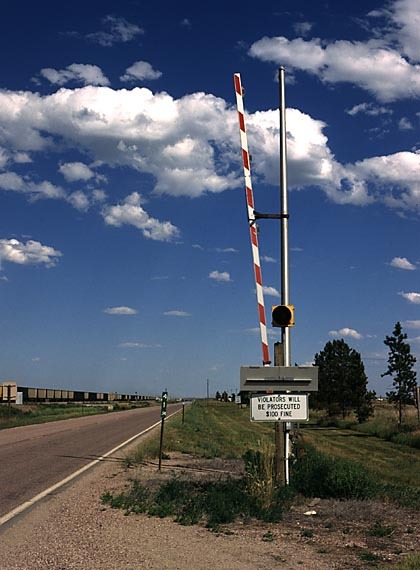 U.S. 20-26 rises to an elevation of 6,208 feet about halfway between the two towns near Waltman, and then enters the North Platte River drainage. Many tiny towns dot the landscape, and only a hearty few live in them. Moneta, for instance, boasts a population of five people. A notable exception to the monotony along U.S. 20-26 is Hell's Half Acre. This pretty badland area is marred by a cheesy motel and gift shop, but if you can look past it, you can see the vastness of the West. The actual badlands area is covers about a half-mile square area, and it is quite a contrast from the relative uniformity of the surrounding ranges. South of the highway is the Rattlesnake Range, and north of the highway is the southern end of the Big Horn Mountains. A county route intersection is at the site of Waltman, about six miles west of Hell's Half Acre. Arminto Road (Natrona County Road 104) and Gas Hills Road (Natrona County Road 212) meet U.S. 20-26 here. If "Gas Hills Road" sounds familiar, it's because CR-212 is an eastward extension of Wyoming 136, which becomes locally maintained in the Gas Hills of Wyoming. Note that this signing is typical of county highway signing from two-lane, arterial highways throughout the state. Sometimes one might find green guide signs with county route markers on them, but that is rare. About 44 miles further down the road, U.S. 20-26 finally enters Casper. You'll pass by the tiny Natrona County International Airport on your way into the city. 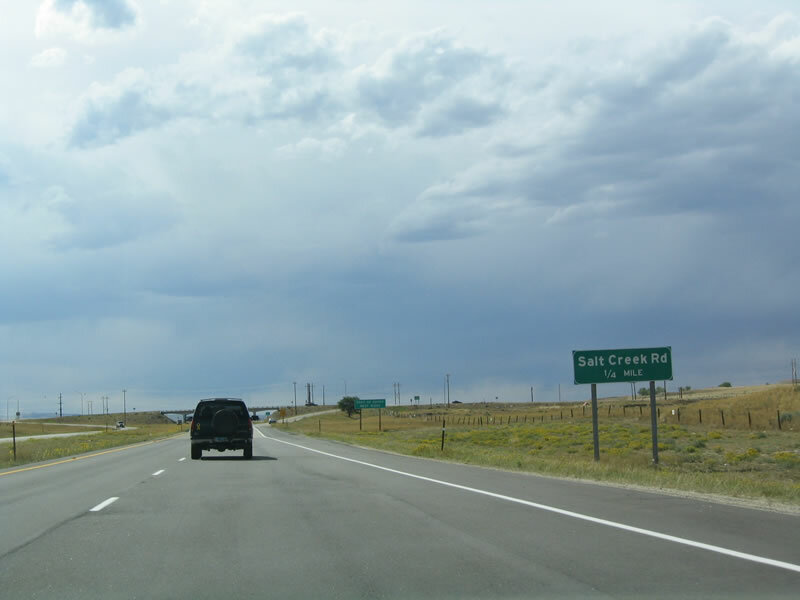 At the outskirts of Casper, travelers may take the Bypass U.S. 20-26 east to Interstate 25 or take the original U.S. 20-26 via Business U.S. 20-26. You'll miss the city if you take the bypass, so we'll continue via the business route. The road is locally called Yellowstone Highway. Casper grew from the discovery and development of the oil, uranium, and bentonite deposits. For a long time in the 1980s, Casper was the largest city in Wyoming. Today, with nearly 47,000 people, it is about 4,000 people smaller than Cheyenne, the capital. The ongoing rivalry between these two cities is amusing, especially when you consider that neither city is near the main tourist attractions for which Wyoming is famous. Casper is worth a stop so you can visit Casper Mountain (via Wyo. 251). Supposedly, when you get to the vista point where you can see all of Casper in front of you, see if you can make out the outline of the horse based on the city's pattern of development. This is likely an urban legend. Continuing eastbound, Business U.S. 20-26 reunite with Bypass U.S. 20-26 at the east Business Loop Interstate 25 interchange near Evansville. 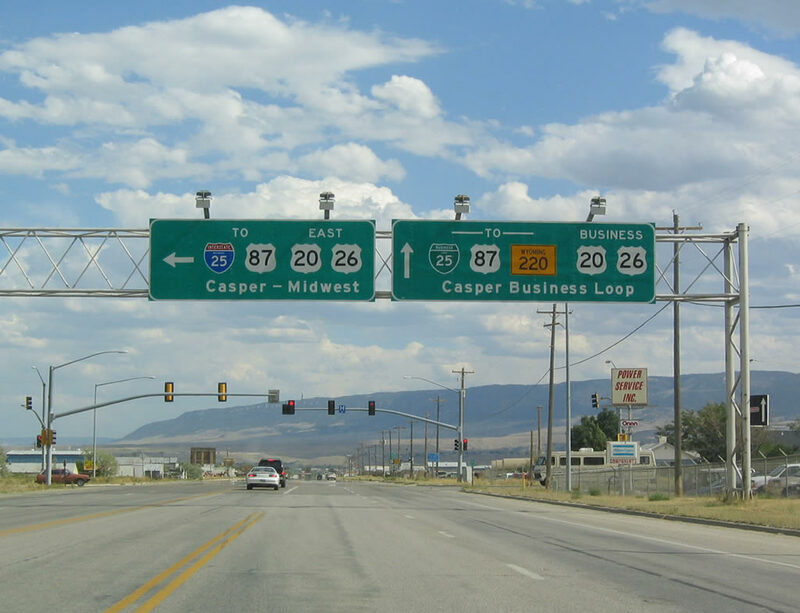 It is a challenge to find a good map that shows Business Loop Interstate 25 in Casper. But it is definitely signed there, as is Business U.S. 87. U.S. 20-26-87 (U.S. 87 joined the route in Evansville) parallel Interstate 25 between Evansville and Glenrock. The highway is four-lanes outside Evansville, but reverts to two lanes as it approaches Wyoming 95, the Glenrock bypass. U.S. 20-26-87 follows the North Platte River at a rough elevation of 4,800 feet. U.S. 20-26-87 passes some oil refineries, but it is sucked into the interstate at Glenrock. For more on the section of U.S. 20 between Glenrock and Orin, see the Interstate 25 guide. At Orin, U.S. 20 breaks free of Interstate 25 and U.S. 26-87, but it is now paired with U.S. 18. Orin marks the western terminus of U.S. 18. You can see behind you the pyramid-shaped Laramie Peak (10,272 feet); Orin is at about 4,700 feet above sea level. As you travel east toward Lusk, U.S. 18-20 hit the tiny communities of Shawnee, Lost Springs, Keeline and Manville. Lost Springs is the smallest incorporated town in the United States, with a population of four. The pine-covered Rawhide Buttes are located about twelve miles to the south of U.S. 18-20. Finally reaching Lusk, U.S. 20 finally breaks free of its last companion route, as U.S. 18 merges with U.S. 85 toward Mule Creek Junction. As it heads to Nebraska, U.S. 20 is not paired with any other route for the only time in its entire Wyoming trip. 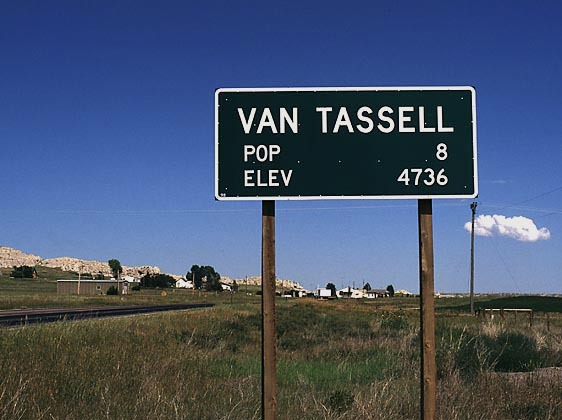 U.S. 20 descends along the Niobrara River toward Van Tassell, another small incorporated community of eight persons. Two miles later, U.S. 20 is in Nebraska, heading toward Chadron and Valentine in the Sand Hills. 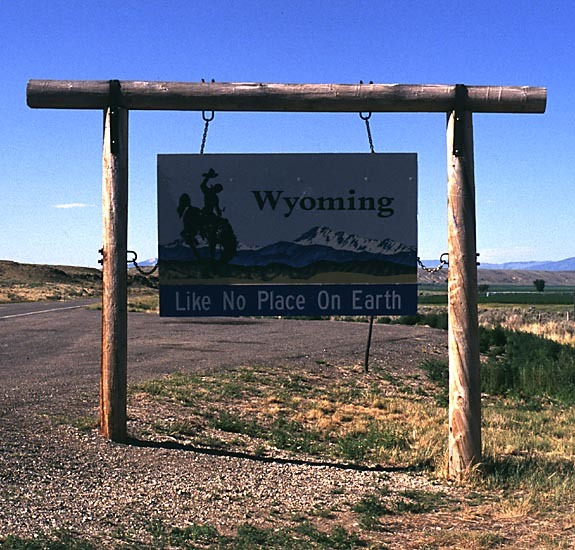 As U.S. 20 westbound passes from Nebraska into Wyoming, this large welcome sign invites visitors and residents into the Equality State. Photo taken by Dale Sanderson, 04/04. After passing through Van Tassell and Node, U.S. 20 approaches the city of Lusk, which is the seat of Niobrara County. Now entering downtown Lusk, westbound U.S. 20 (3rd Street) reaches its junction with U.S. 18-85 (Cedar Street). Photo taken by Dale Sanderson, 04/04. 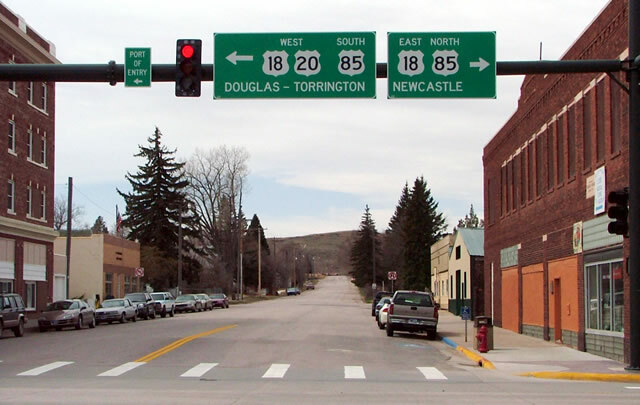 Much further to the west, westbound U.S. 20 and northbound Wyoming 789 reach Wyoming 120 in Thermopolis. This marks the southern terminus of Wyoming 120, which is an excellent alternate route to U.S. 20 between Thermopolis and Cody. Photo taken by Rich Piehl, 5/01. After exiting from Interstate 25/U.S. 87 and passing under the freeway overpass, U.S. 20-26 continues west toward Salt Creek Highway (Wyoming 254) and thence onward to rejoin the Yellowstone Highway (Business U.S. 20-26). 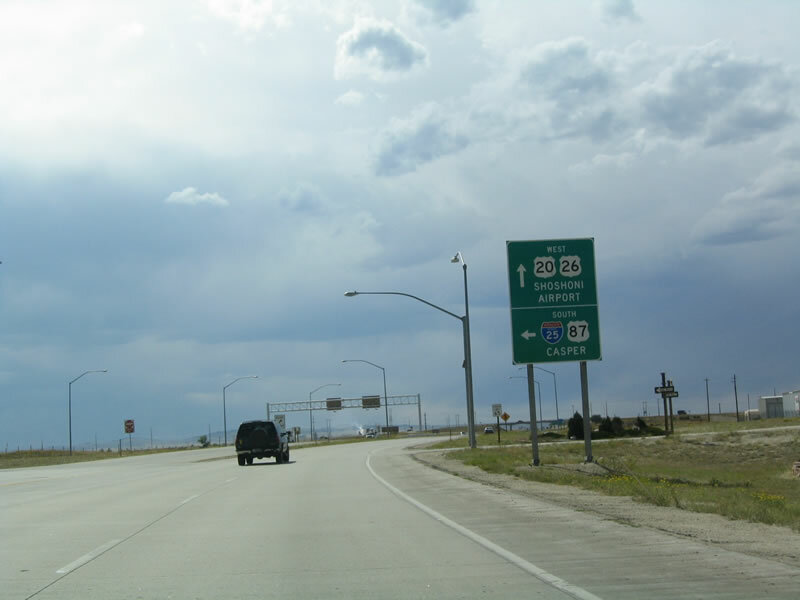 The section of U.S. 20-26 between Interstate 25 and Business U.S. 20-26 is a freeway, with an interchange at Wyoming 254. Photo taken 09/01/04. A diamond interchange provides for the connection from U.S. 20-26 to Wyoming 254, Salt Creek Highway. Salt Creek Highway is the old alignment of U.S. 87 (and prior to 1936, it was U.S. 87E). It travels north toward Bar Nunn, and it connects to Business U.S. 20-26 to the south. Photo taken 09/01/04. There is only one advance sign for the interchange along with this gore point signage. Use this exit for a port of entry (perhaps more commonly known as a weigh station in other states). Photo taken 09/01/04. This reassurance shield assembly is posted on westbound U.S. 20-26 after the Salt Creek Highway (Wyoming 254) interchange. Photo taken 09/01/04. The left lane turns onto eastbound Business U.S. 20-26/Yellowstone Highway toward Mills and Casper, while the right lane turns west to follow the Yellowstone Highway toward Natrona, Powder River, Hells Half Acre, Waltman, Hiland, Moneta, and Shoshoni. It is about 90 miles between this junction and Shoshoni, where U.S. 20-26 meets Wyoming 789. Photo taken 09/01/04. Although the signage seems to indicate otherwise, the junction between U.S. 20-26 and Business U.S. 20-26 is not a freeway to freeway connection. To reach the Natrona International Airport, follow U.S. 20-26 west. To return to Casper, turn left onto Yellowstone Highway. Photo taken 09/01/04. These reassurance shields are posted immediately after the Business U.S. 20-26 junction. At the time this photo was taken, late-summer storms were brewing to the northeast of Casper. Photo taken 09/01/04. Westbound U.S. 20 and Northbound Wyoming 789 at Wyoming 120 in Thermopolis. This marks the southern terminus of Wyoming 120, which is an excellent alternate route to U.S. 20 between Thermopolis and Cody. Photo taken by Rich Piehl, 5/01. 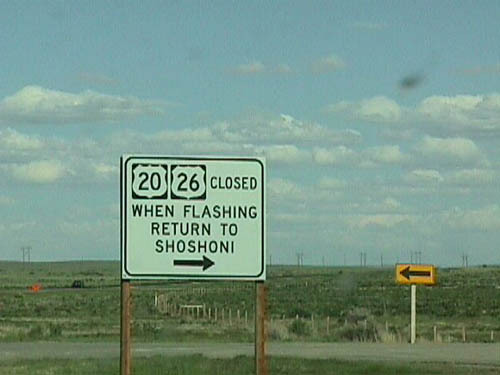 Whenever U.S. 20-26 is closed, this sign is activated, and all traffic must return to Shoshoni. 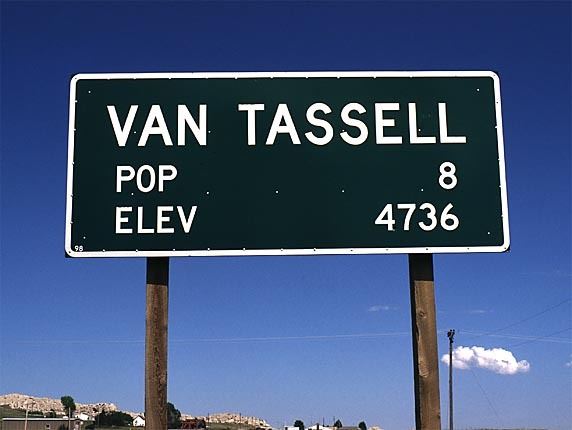 This sign is activated during times of severe weather or accidents; it is a two-hour drive from Shoshoni to Casper, the next major town headed eastbound. Photo taken by Mike Ballard, 08/22/98. 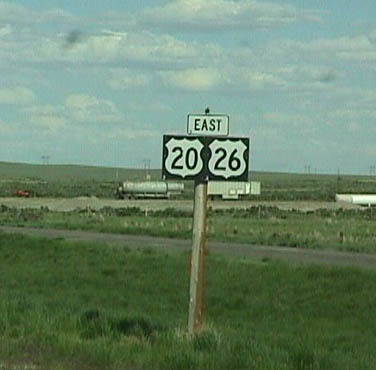 These eastbound U.S. 20-26 shields are located near Shoshoni in northeastern Fremont County, which is the largest county in Wyoming. Photo taken by Mike Ballard, 08/22/98. 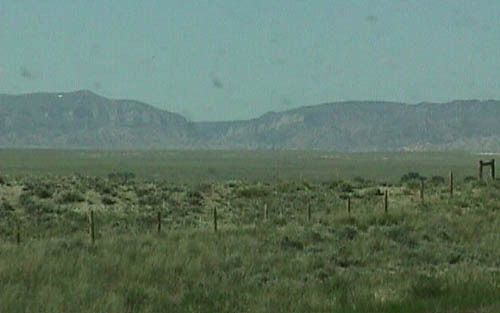 This is a sample of the rugged terrain encountered along eastbound U.S. 20-26 between Shoshoni and Casper. Photo taken by Mike Ballard, 08/22/98. Eastbound U.S. 20-26 reaches its junction with Natrona County Route 104 and Natrona County Route 212. County Route 104 is Arminto Road (Waltman Road), and it leads to the site of Arminto next to the Burlington Northern Railroad tracks a couple miles north of U.S. 20-26. Natrona County Route 212 leads southwest along Gas Hills Road. Gas Hills Road turns west to cross into Fremont County, becomes Fremont County Route 267 (Dry Creek Road), then links with Wyoming 136 near the old uranium mines. 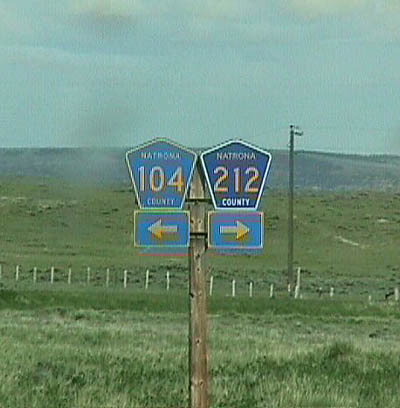 Like many other states, Wyoming uses the standard blue and gold pentagon to mark its county routes. Photo taken by Mike Ballard, 08/22/98. Continuing east, U.S. 20-26 passes by Hells Half Acre, Powder River, and Natrona before entering the Casper metropolitan area. Consisting of Mills, Bar Nunn, Casper, and Evansville, this is the most populated urban area in Wyoming with over 50,000 residents between the four communities. U.S. 20-26 expands to four lanes as it passes by Natrona International Airport, and the highway splits at the next major intersection. U.S. 20-26 bypasses the city to the north, so it splits off the route and joins Interstate 25 and U.S. 87. Business U.S. 20-26 continues east via the Yellowstone Highway into Mills and ultimately Casper. After passing through downtown Casper, the business route reconnects with Interstate 25. Photo taken 09/01/04. This overhead sign points the way for the split between U.S. 20-26 and Business U.S. 20-26. 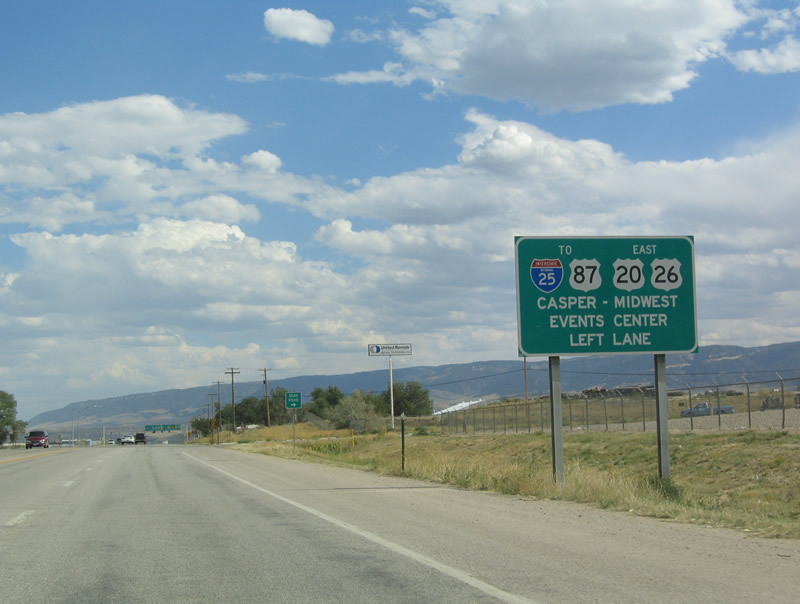 Follow U.S. 20-26 east to bypass Casper and connect directly to Interstate 25. 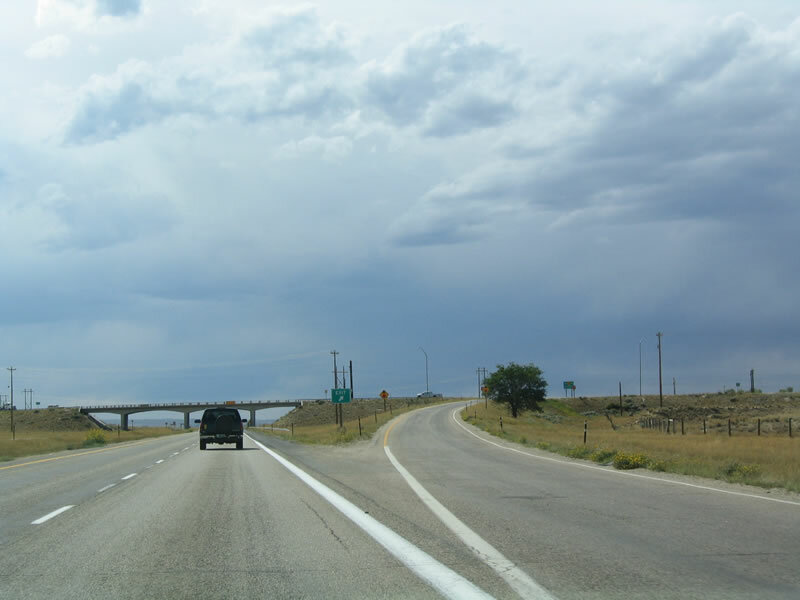 Interstate 25 and U.S. 20-26-87 merge together, remaining north of downtown Casper as the freeway travels east toward the cities of Glenrock and Douglas. U.S. 20-26 east to the Casper Events Center, which is the location of concerts and theater events. Business U.S. 20-26, meanwhile, travels east along Yellowstone Highway into Mills, enters Casper, meets Wyoming 220 (Poplar Street), and crosses the North Platte River bridge. Following First Street, the business route enters downtown Casper. 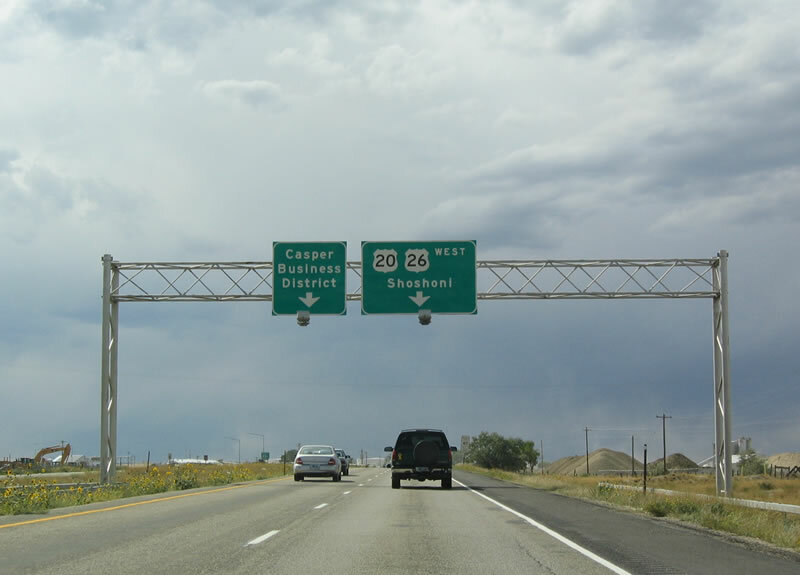 At the intersection with Center Street in Casper, Business U.S. 20-26 merges with Business Loop I-25 and Business U.S. 87; the four routes then turn northeast via Yellowstone Highway to return to Interstate 25 and U.S. 20-26-87 at Exit 186. Photo taken 09/01/04. This U.S. 20 shield is found along eastbound U.S. 20 as it leaves Lusk. Since U.S. 20 is merged with at least one other highway (Interstate, U.S., or state), this is a rare shield assembly that features only U.S. 20 and no other merged (braided or cosigned) routes. Photo taken by Jonathan Winkler, 8/00. This snow gate is located along eastbound U.S. 20 (3rd Street) just outside of Lusk. Photo taken by Jonathan Winkler, 8/00. Eastbound U.S. 20 in Van Tassell. 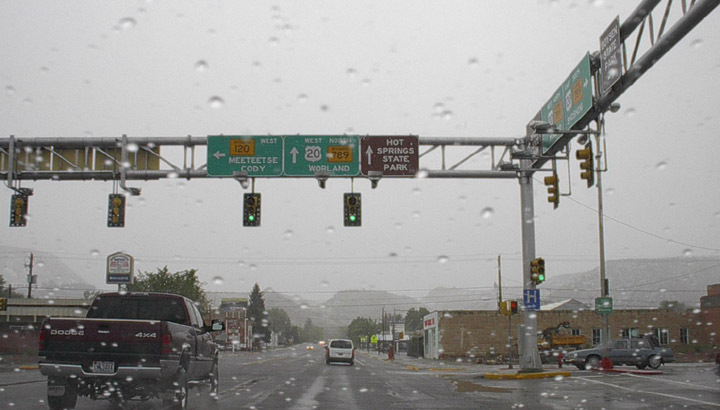 The first three signs show the population and elevation sign on eastbound; the second two signs show a standard Wyoming speed limit sign; and the last signs show the adopt-a-highway signage. Photos taken by Jonathan Winkler, 8/00.